Salt sprays seem to be a popular staple in the beauty world, particularly for giving those beachy waves in your hair. I'd never actually tried a salt spray until recently as I wasn't sure if they would be drying for my hair, but you really don't need to worry with the Olivine Atelier Love + Salt Beach Hair & Body Mist* thanks to the blend of 4 different salts and the addition of fractionated coconut oil. Even though summer is coming to an end, I think it's perfectly acceptable to use salt sprays all year round to help give that effortless, texturised waves! I've been loving misting this over my hair after washing (and yes, this pump actually does give a nice even mist!) to give a bit more texture and wave, and a subtle, fresh scent to my hair. I just scrunch up my hair after a liberal spritz and once my hair dries naturally I'm left with more pronounced and texturised waves than usual, without that horrible crunchy feeling you can get with some hair styling products. Olivine's founder also suggests spraying on dry hair, tie it up in a topknot overnight and wake up to the ultimate beachy waves in the morning. This can also be sprayed on the body too, but I've just stuck to using it on my hair personally (mainly because the ingredients don't specifically state if the fragrance is natural or synthetic). I absolutely love the packaging and branding of this product. It comes in a glass bottle, which is by far my favourite type of packaging, the gold lettering adds a touch of luxury and the pump gives the perfect mist! This full sized bottle is 8oz (£14.00), but a mini size 2oz (£8.00) is also available which would be perfect for travelling. Olivine's Love + Salt Mist is available in the UK exclusively at abeautifulworld. Do you like to use salt sprays in your routine? 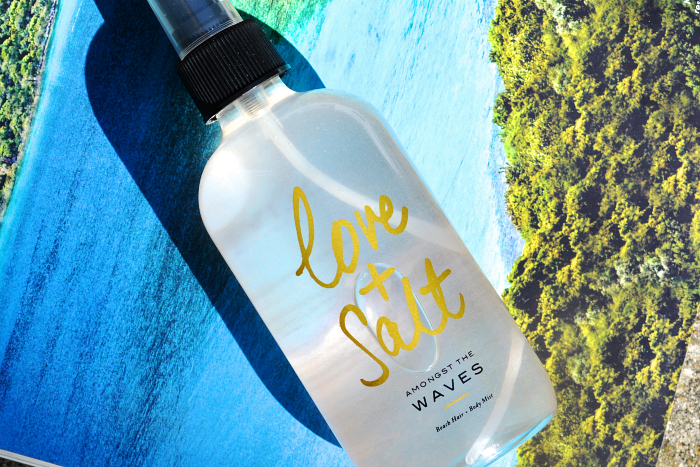 Have you tried this Love + Salt Mist before? I'm usually not a big fan of sea salt sprays as they're mostly just salt and water in a bottle. I can mix that myself, thank you very much. This looks a bit more promising though. Love the packaging! I've never used salt sprays because I'm afraid it won't do much for my stick-straight hair. Do you find that the salt spray dries out your hair at all? Personally I don't find it dries my hair out :) I don't use it every day though and always use a leave-in conditioner spray before!